A set of synthetic Mars rocks will be making a national tour next week to promote the upcoming landing of NASA's giant new rover on the Red Planet. The tour is part of a campaign called "Get Curious" that was created to honor the new Curiosity Mars rover, the main element of the Mars Science Laboratory mission, which is due to land on our neighboring world Aug. 6. The $2.5 billion rover is designed to spend at least two years on Mars searching for clues that Mars may have been habitable to life at some point. "Get Curious" will send large boulders manufactured to look like Martian rocks to eight U.S. cities between July 26 and Aug. 9. No rocks have ever been brought back to Earth from the Red Planet, but these large synthetic constructions are designed to resemble the real thing as closely as possible. The rocks will visit Atlanta; Austin, Texas; Boston; Detroit; Columbus, Ohio; Houston; Indianapolis; and Orlando. "We are excited that Columbus was designated a 'Mars City,' and that COSI can be a part of the 'Get Curious' campaign," said Joshua Sarver, senior director of experience design and production at the Center of Science and Industry (COSI), the stop location in Columbus, in a statement. "We continually think of ways to captivate our visitors at COSI, and we think the Mars rock in front of the center will attract a lot of attention and pique interest. 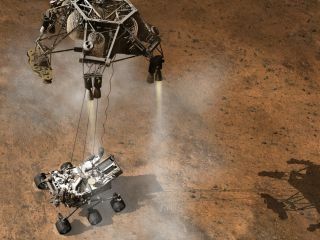 We are pleased to be able to show our support for the Curiosity rover landing and continue to help raise awareness for scientific discovery and space exploration." A synthetic Mars boulder on display in Boston at the Boston Museum of Science. Boston was designated one of eight 'Mars Cities' by Explore Mars for their 'Get Curious' campaign. Each ersatz Mars rock will be emblazoned with the URL www.GetCurious.com and a QR code plaque directing people to the campaign's website. The project is sponsored by Explore Mars, a Mars exploration outreach nonprofit, and rocket company United Launch Alliance, which built the Atlas V-541 rocket that launched Curiosity toward Mars in November 2011. Follow SPACE.com @Spacedotcom, on Facebook and Google+.